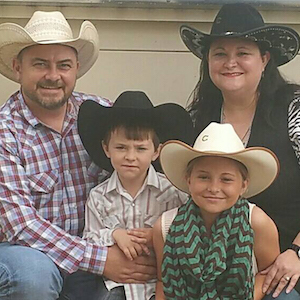 Hillmon & Brandy Davis (with Faith & Axel) has joined with Three Trees Cowboy Church of Wynne, AR to start Rusty Nails Cowboy Church in Forrest City, AR. The vision for RNCC started as Hillmon’s wife, Dr. Brandy Davis, MD, drove past the Wiley T. Jones Fairgrounds south of Forrest City and told her Husband, that she thought it would be a great place for a cowboy church. Hillmon could not stop thinking about the possibility. The family began to pray about the venture and conferred with Bro. Tracy Wilson from 3Ts. 3Ts had been praying for a ministry to start in that location as well. At the time, Hillmon was bi-vocational pastor at Wheatley Baptist Church, in Wheatley, AR at the time. He also worked as a school teacher with the Wynne School District. Wheatley Baptist, 3Ts, and the Arkansas Baptist State Convection joined forces to assist with the vision/mission. Hillmon was saved at Broadmoor Baptist Church in Brinkley, AR at the age of 13. He was called to preach the same summer he accepted Christ. Later, he graduated from Ouachita Baptist University and Mid-America Baptist Theological Seminary. Hillmon had previous church planting experience starting a church, Lifeway Church, in Arlington, TN with Bartlett Baptist Church, the Tennessee Baptist State Convention, and the Mid-south Baptist Association. The Davis family loves their four horses: Penny, Banjo, Storm, and Rocket. Faith and Axel compete in a variety of rodeo and horse show events. Faith qualified for the Arkansas State Horse Show in 2014 & 2015. She also qualified to attend the Little Britches National Rodeo in Pueblo, CO in 2015.